This isn’t my usual type of read at all. However, past experiences of dipping my toes in other genres have proven successful in finding one of my favourite reads (The Best Exotic Marigold Hotel), so I thought I’d give it another go! Now, I’ll tell you upfront, this book didn’t turn out to be a favourite read of mine, but a solid choice nonetheless. Nina George is German based writer, and so I was initially concerned that this book may get lost in translation (remember my experiences with the Dutch novels? ), however, it remains rather neutral. 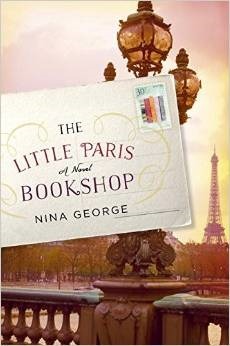 Set in modern day Paris, The Little Paris Bookshop follows Jean Perdue, a bookseller that sells his products from a river boat. Jean is very in-tune with his customer’s feelings and knows exactly what they should read in order to make them feel better, much like a chemist, but the prescription is books! We learn that Jean’s wive left him quite a few years ago, and one day he finds a letter that explains a lot. This sets of a trip he takes down the river Seine and throughout France. Along the way he meets a host of characters and experiences life like he never had whilst in Paris. George writes a good story and I will be reading further offerings from this author. The characters are realistic (to a point), and are given enough emotion so that the reader cares about them. If you’ve never been to Paris, or France in general, you will want to go after reading this, so start saving those pennies! If you’ve been before, you will want to re-visit, so again, I say to you, start saving those pennies! This novel is a mixture of heartbreak, comedy, and passion. Passion for fellow human beings and indeed passion for books. Sometimes, an eye roll did almost occur, however, this is a nice light read and should be taken for what it is. If you’re looking for something different, but not too different, then definitely give this one a chance! Set in Paris, and partly about a bookshop? Need to read asap! Excited to learn more about him and his experiences.